If you’re looking to increase the overall appeal as well as the resale value of your home, retrofitting a bathroom or recreational room with radiant floor heat can help. Add to that the benefit of reducing your dependency on fossil fuels associated with forced air systems, and you’ve hit one out of the park in terms of savings. 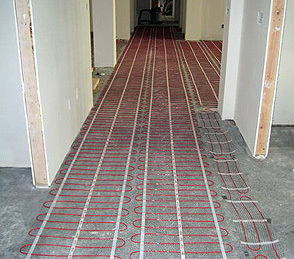 Radiant heat is a very efficient way to heat your home. Why? Warmth generated by electric radiant heat radiates up through the floor and transfers heat through objects for more consistent, even heat distribution. With traditional forced air systems that kick on and off in an effort to maintain the desired temperature, the heat quickly rises, and you’re subject to the unpleasant effects of drafts throughout your home. How much can you save in heating costs, just by keeping it warm and cozy right down to the floor boards? Radiant heated floors can save you up to 50 percent in costs compared to a traditional forced air system, and can outlast a forced air system by as much as 15 years. Unlike forced air systems, the standard thermostat controls can be programmed to control different zones of your home, so you can time heating, room by room, to respond to the way you live your life. With no moving parts, electric heated floors are virtually maintenance free. There are no vents to clean or filters to replace. Unlike forced air systems, there’s no noise, dust, or allergens blowing through your home – just quiet, comfortable warmth. 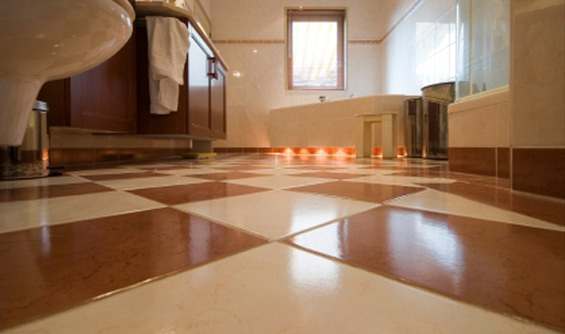 If you are ambitious, you can install much of the radiant heated floor system yourself. (But it is important that a qualified electrician perform all the wiring.) Depending on the pre-existing construction and the system you choose, installation can be relatively easy. Warmzone offers a variety of safe, proven radiant heat flooring solutions for your home, along with the service and support you’ll need to complete the installation yourself, including personal, expert installation support and resources such as system diagrams, installation manuals and more. You may or may not be surprised to know that radiant heat is affordable. Radiant heat is a relative newcomer to the home heating arena. And that makes it more of an “exotic” home improvement project that will attract a lot of interest from neighbors and perspective home buyers alike. But by no means is it costly. For a few hundred bucks, you can upgrade a bathroom or foyer, and significantly downgrade your heat bill. If going green is your goal, you also score major points with radiant heat. Not only can you improve the air quality of your home while reducing your dependence on fossil fuels, you can also sync a radiant floor heating system with solar or wind power to help you make your move off the grid. If you’re contemplating an equity building home improvement project, you may want to consider adding radiant heat to your list of options. To learn more about a viable radiant heat system for your home, call Warmzone at 888.488.9276 or visit www.warmzone.com. Spring has sprung, and you’re undoubtedly ready to leave the ice and snow behind. You can leave it behind permanently by installing an electric radiant heat solution for your driveway and walkways. And right now couldn’t be a better time. The spring and summer months are a great time to take advantage of better prices and install a radiant heated driveway before the winter rush. What’s really great about radiant heat systems is their cost relative to other home improvement projects. Heating your walkways and driveways doesn’t have to involve a completely new pour or tear up of these areas. Retrofits are particularly adaptable to asphalt driveway heating. Choose Warmzone and you’ll also have a seasoned team of radiant heat professionals in your corner that can take your requirements and budget, and turn both into a system that exceeds your expectations. When all is said and done, the initial cost of installing radiant heat in your walkway or driveway could more than pay for itself in the money you’ll stand to save. Taking on the added expense of a typical snow removal service can cost you. In most cases, you’re paying for a specific period of time, or package. Depending on the amount of snowfall, there’s a good chance you’ll never even benefit from the services you’ve paid for. Add to that the hassle of waiting for your service to show up. In a particularly heavy snow storm, the wait could be quite long. Whether this is your first time or you’re an experienced do-it-yourselfer, if you’re willing to take on the project, you’ll find Warmzone has many tested and true options for snow removal that won’t have you scratching your head at installation time. From ClearZone radiant snow melting mats to heating cable off the spool, Warmzone can match your skill level and ambition. In addition to a wide variety of products, Warmzone also offers personal installation support as well as installation manuals. Detailed system design layouts are also provided to ensure that all the power and installation issues are addressed prior to any installation taking place. What’s really cool—you’ll have a snow removal system that does the work for you. All Warmzone snow melting systems are fully automated. They feature a high-tech snow sensor that can detect the slightest changes in temperature and precipitation in anticipation of a snow event, so the system is working just as the first snowflake hits the ground. The best part—you can sit inside enjoying that morning cup of joe to the sound of your neighbor’s snow blowers and shovels because your radiant heated driveway is already clear and dry. Of course the other benefit of installing radiant heat now is the mild conditions spring and summer provide. And the timing is perfect if your plans include a concrete or asphalt pour. So why not beat the inclement weather with a radiant heated snow melting solution? Call Warmzone at 888.488.9276 or visit them at www.warmzone.com for more in-depth information and professional consulting, all free of charge, of course!